We are delighted to announce the details of our latest summer school. The tutors will be Harriet Earis (our Director of Music, Jazz and Celtic Harp), Eleanor Turner (Head of Harp at Royal Birmingham Conservatoire and Classical Harpist) and Adriano Sangineto (Continental Dance and Folk Music). They will be assisted by Assistant Tutors, Manon Browning and Martha Powell. The first three groups will be taught in workshops by the three main tutors and beginners by our assistant tutors. In addition, all will attend/participate in masterclasses. On the final afternoon we will have what is now a traditional part of our summer schools, the final concert featuring students, tutors and assistant tutors. On Wednesday evening August 28th, there will be a special event ‘It Takes Guts!’, a spiral of discovery and adventure through harp playing, the spoken word and visual illustration, presented by Internationally acclaimed solo artist Sioned Williams. On the final day of the school, Saturday, August 31st, students and tutors will come together, as they have in previous years, to present the Summer School concert, an opportunity to discover the fabulous range of music played on the harp. The concert takes place at Gwernyfed High School at 3.30pm. 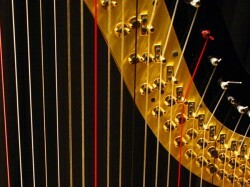 Glasbury Arts Harp Summer School runs from Wednesday, August 28th to Saturday, August 31st 2019. Harp Summer School Ticket prices: Summer School, £200 (full price adults); £150 (adult concessions; over 65s or unwaged); £95 (in full time education) including tea/coffee/soft drinks throughout, ticket for Wednesday evening event and Saturday final concert.